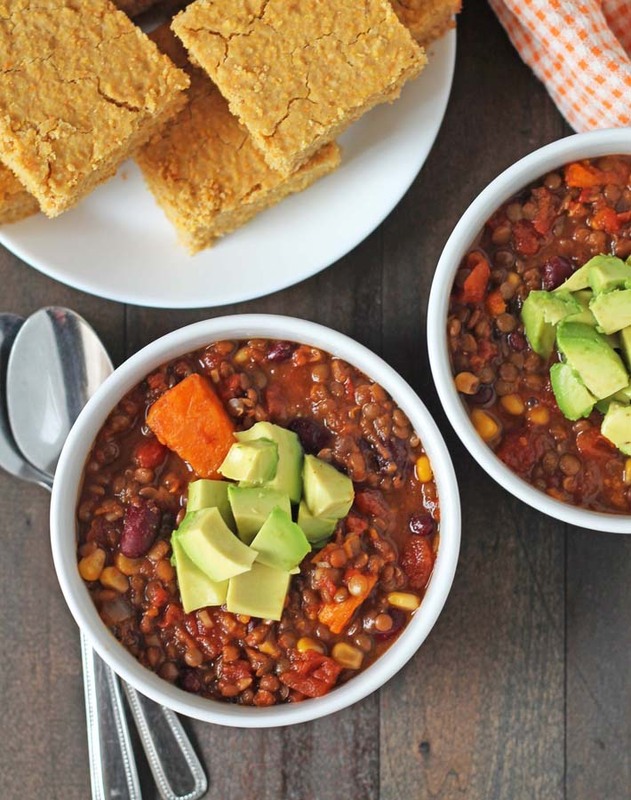 If you’re looking for an easy, delicious, and nutritious vegan comfort meal, look no further! 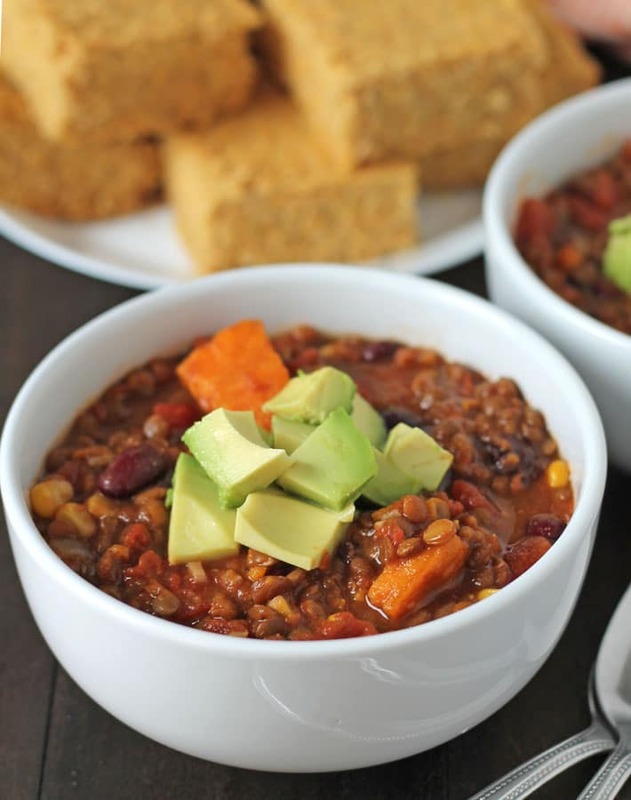 This easy and hearty vegetarian Slow Cooker Lentil Sweet Potato Chili checks all of those boxes and it’s the perfect way to warm up on a cold day. Remember when I told you how cold it has been here when I shared my recipe for slow cooker curried cauliflower sweet potato carrot soup? Well, not much has changed since I wrote that post. 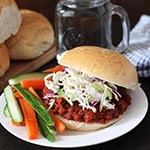 We did get a little breather for a few days when the weather was unseasonably warm(er), but until we hit May, I’m all about easy, slow cooker comfort meals. 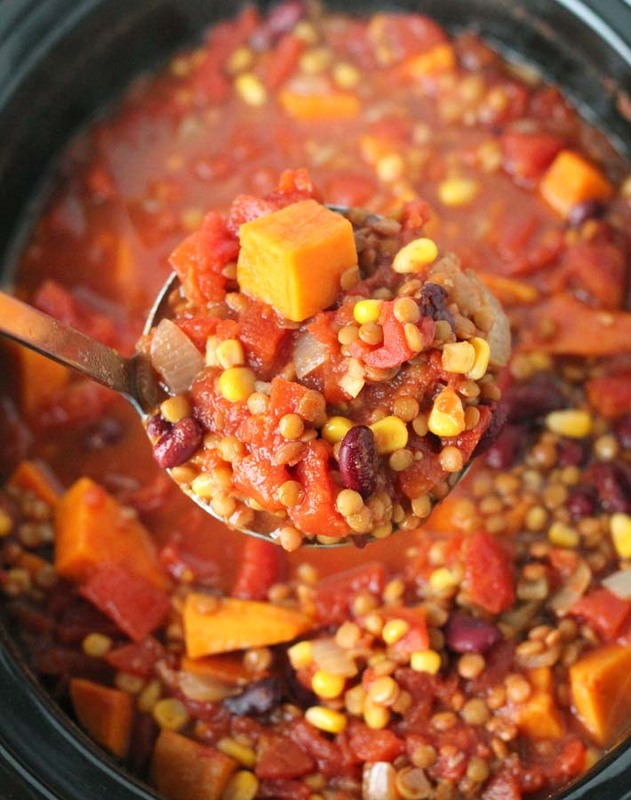 Like this Slow Cooker Lentil Sweet Potato Chili. Chili has actually been on the “banned list” in my home for a while. Why? Because at one point, I made it so many times in the span of a couple months, everyone became sick of it (is it just me or is that kinda of funny?!). Except I never got sick of it because I love chili. 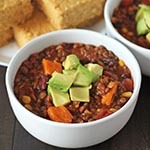 Especially chili made in the slow cooker. Before this time, I think it had been about a year since I made a batch of chili. I gave everyone a heads up that I had planned to make it but instead of making the same old boring bean chili, I was going to change things up. 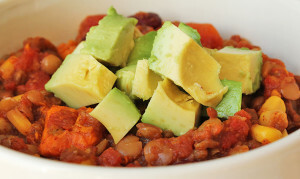 This time, I decided to throw in lentils, cut back on the beans and add sweet potato. It was a huge win and I’m happy to say that chili is back on the rotation. 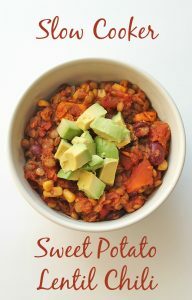 I’ve have been “permitted” to make it again, as long as it’s this Lentil Sweet Potato Chili! 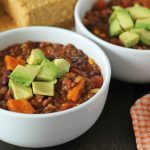 What are the best chili garnishes? 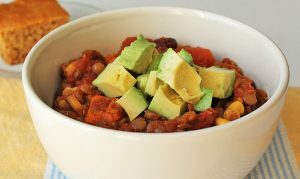 And you can serve your chili with a batch of cornbread, the best side for chili! Yes. This recipe makes a HUGE batch, but the good news is that it freezes well and works great for lunches or a leftover supper for a night you don’t feel like cooking. Keep up with what’s new by following me on social media! Follow me here: Instagram, Facebook, Pinterest, Twitter. 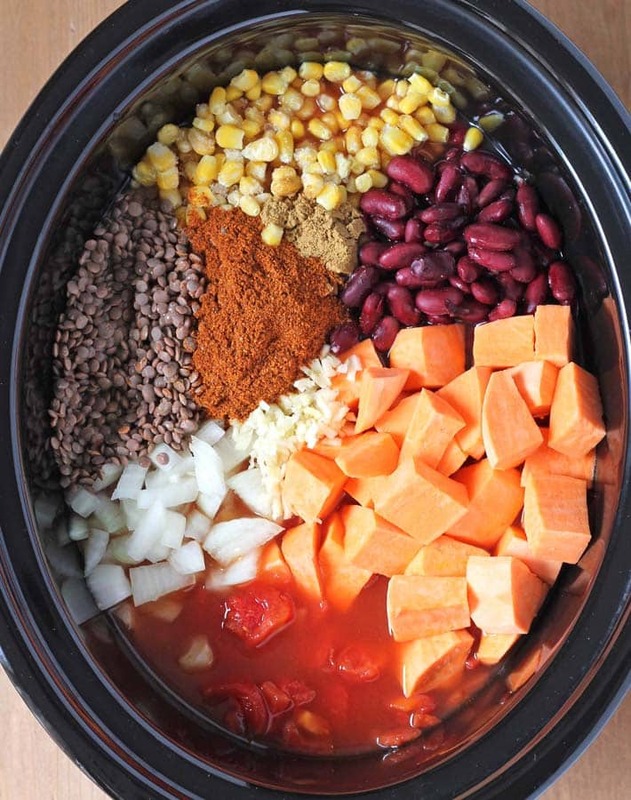 Add all ingredients to slow cooker. Mix well. Season with salt and pepper to taste. More chili powder can be added if you'd like. Give it a taste test and if you find it can use some more, go ahead and add, 1 tsp at a time. This recipe makes a HUGE batch (approximately 12 cups). Luckily, this chili freezes very well. Freeze the leftovers or use them for lunches or another supper later in the week. I use a low sodium vegetable broth and no salt added diced tomatoes. Nutrition info is based on 1 of 6 servings (2 cups per serving). Nutrition info does not include any garnishes and uses 1.5 teaspoon of salt and 1 teaspoon of black pepper. Info is only to be used as a rough guide. Click to learn how nutrition info is calculated on this website. 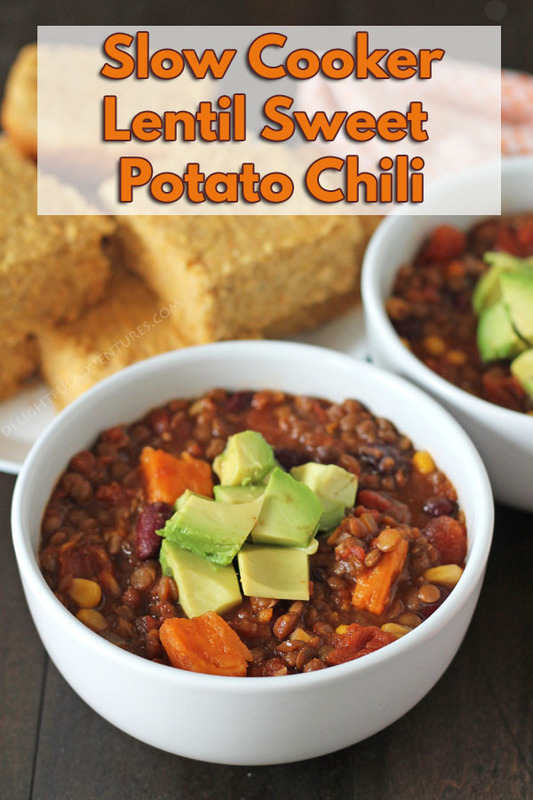 This Slow Cooker Lentil Sweet Potato Chili recipe was originally published January 26, 2015, images were updated October 2018. Hi Susan, yes, brown lentils can be used in place of the green 🙂 I hope you love the chili! I do not like beans. Could I add extra lentils or maybe you have a suggestion? There was a lot of liquid still in the crockpot after 9 hours. Should the diced tomatoes be drained before being added? Hi Kristen, no, there’s no need to drain the tomatoes before you add them. As the lentils cook, they soak up a lot of the liquid in the slow cooker. I can try to troubleshoot with you…did you add all the ingredients in the ingredient list? And did you add the correct type and amount of lentils? Or were your tomatoes from a can that contained a little more liquid than usual? Did you drain the cans of beans? In the finished chili, there should be a little liquid, like a regular chili, but not so much that it makes the chili too liquidy. 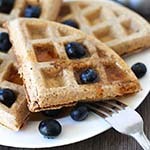 I hope some of these things helped you troubleshoot, sorry the recipe did not turn out for you! Hi! The cans likely contained more liquid than normal. I noticed there was a lot of liquid before adding the broth. I’ll drain them a bit next time. Thank you for the quick response!!! I was really excited for this recipe but after 4.5 hours on high my sweet potatoes are still hard! Did anyone else have this issue? Maybe I didn’t cut them small enough. They’re about 1/2 inch pieces. Going to keep it on high and check every half hour. Looks like it’s going to be a late dinner tonight. Hi Claudia, sorry to hear it did not work well for you, however, I’m not quite sure why your sweet potatoes would still be hard after 4.5 hours on high. I usually cut mine to the same size, about 1/2″ and they cook fine both on high and low. I hope they didn’t take much longer to cook for you! I’m not sure why but my lentils didn’t cook! That’s after 6 hours on high and an additional 9 hours on low, puzzling! Hi Alyssa, sorry to hear this! Did you use green lentils? And were they fresh? Older beans and lentils tend to not cook properly (if at all). Other than that, I can’t think of any reasons why green lentils would not cook after sitting for 14 hours in your slow cooker. At that point, they should have been really mushy.